A few days ago I posted a video of Gus using a wavy chopper to cut up some carrots for our dinner. Then, I got a bunch of questions on how we introduce the wavy chopper and have so much success with it. This is Gus' chosen knife at the moment, it helps him contribute to many of the meals we make together for the family. But, it has been a process to get him to the point where he can use it independently. 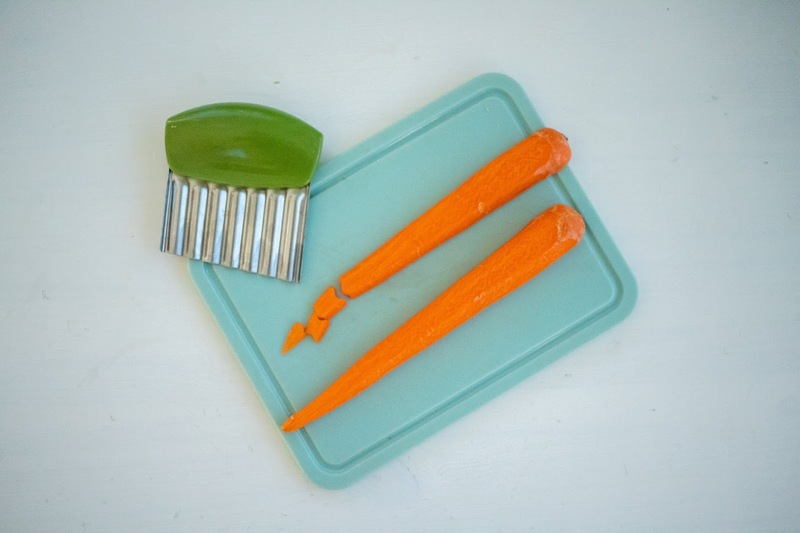 With a few quick tips, any toddler can start to successfully use this useful kitchen tool. Start soft -- Start with softer foods, hard-boiled egg, fruits, soft cheese or meats. Or pre-boil/cook harder foods for a few moments. This will help your child become successful at holding and using the knife without needing as much strength. As your child gets more proficient at using the knife, introduce harder foods. 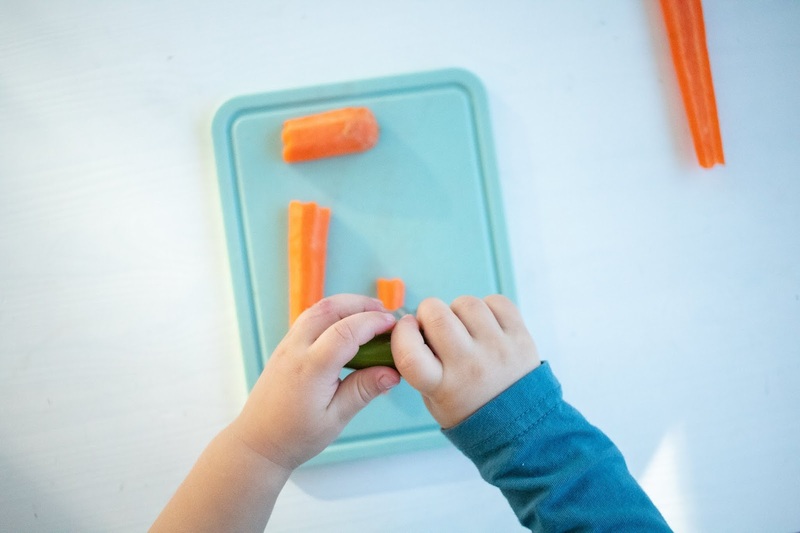 Start Small -- Cut food a bit before giving it to your child to cut. Again, with only one or two cuts necessary to complete the job, your child will feel more success and have more interest in completing the task. 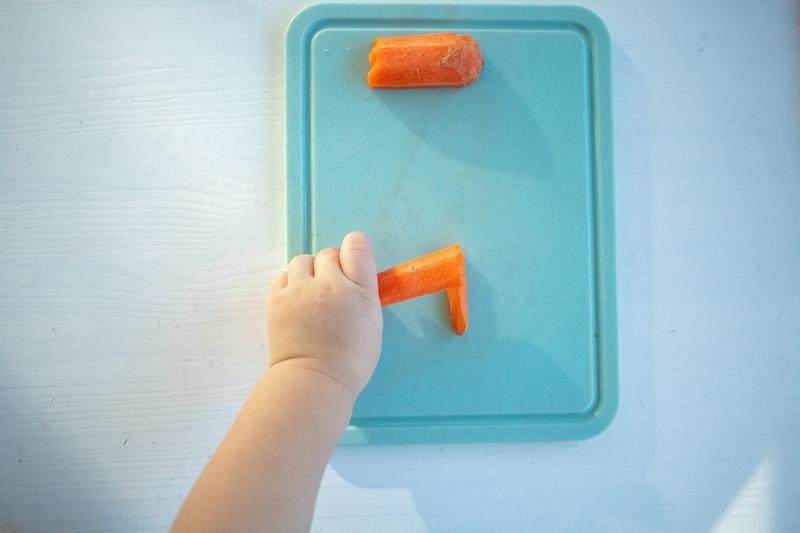 As your child gets better at chopping, you can give larger pieces at once. Make it Flat -- For round foods, cut them in half first. It's so much easier, and safer, as a child is learning to have a food cut in half so it doesn't roll around. Again, as your child masters the cutting motion, you can begin to introduce round food. 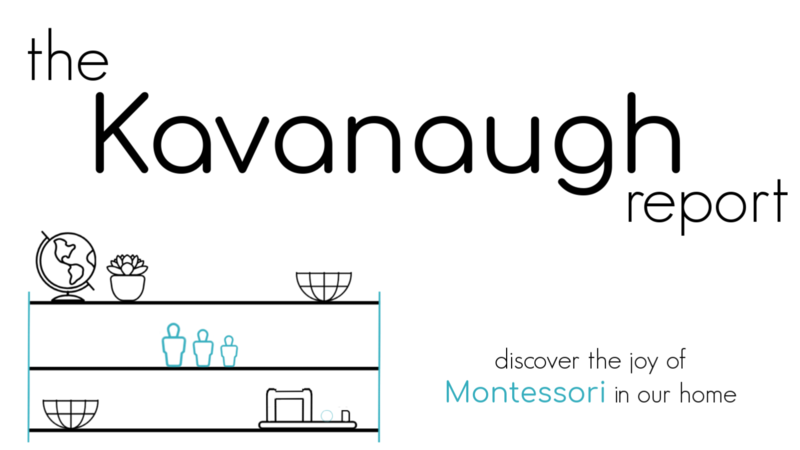 If you're interested in teaching your child to cook, don't miss my e-course Confidence in the Kitchen. Non-slip Cutting Board -- You know how some cutting boards just slide all over the place as you use them? Avoid those. Use a cutting board that is going to stay securely in place as your child cuts (here's one example). A small one that isn't too big for them to manage is also a bonus. 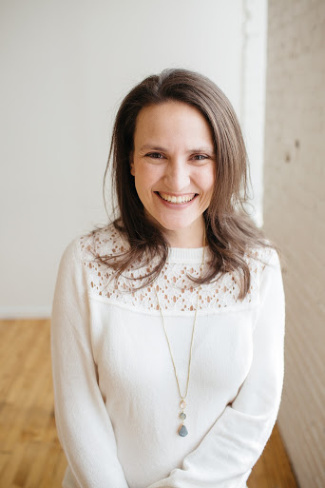 Standing Up -- Allow your child to cut somewhere that his/her feet are on the floor, this will give your child the most leverage possible to be successful. 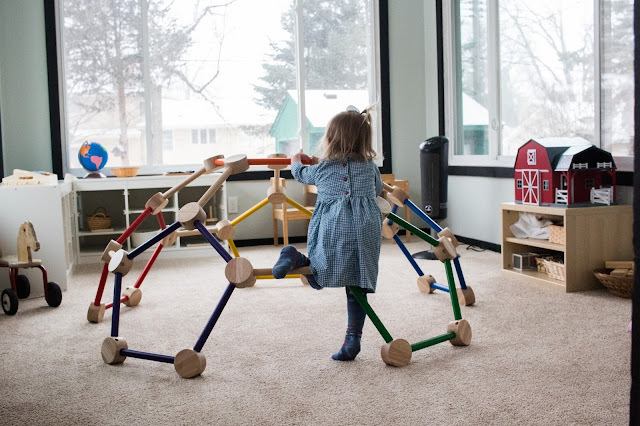 A learning tower would also work, since it gives your child this same optimal standing position. Rotate the Cutting Board -- Maybe this is just me, but I tend to cut left to right. Well it's really hard to hold a wavy chopper and cut this way, so rotate the board vertically. This way a child is chopping up and down. This avoids weird wrist rotation that might hinder the process. 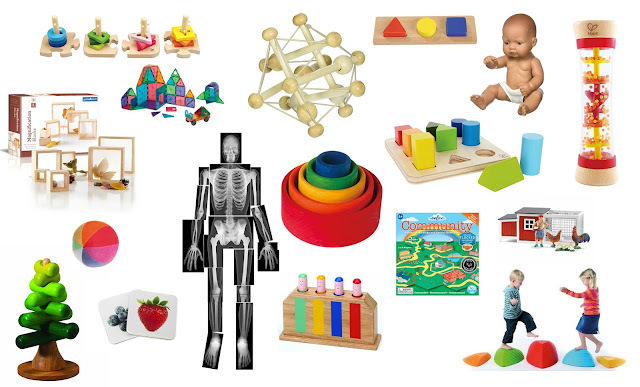 Model -- When you're first introducing a new tool, you need to model it for your child. Don't be afraid to pull it out and use it at first, even if you have a more efficient tool at your disposal. It will be through watching you use this tool that your child will learn to use it. Avoid Correction -- You don't need to correct your child (unless there is a truly dangerous situation) on how to use the chopper. Your child will explore and experiment, that's totally normal. 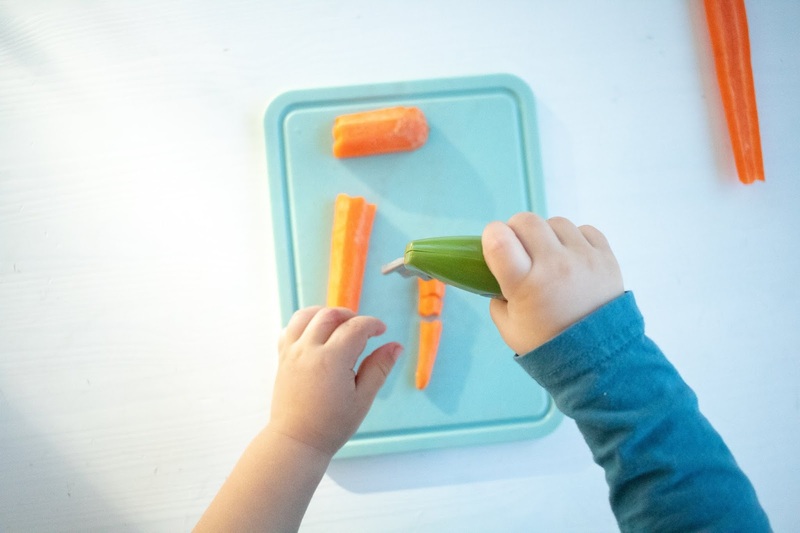 He/She will learn the most efficient way to use the wavy chopper and over time learn to cut smaller and smaller chunks - no adult intervention required. The wavy chopper can be a fun and easy way to get even very young toddlers involved in the kitchen. Here are some other knives you might consider for your child - depending on his/her age and stage. Does your child enjoy the wavy chopper? Any other tricks you've found while introducing it?